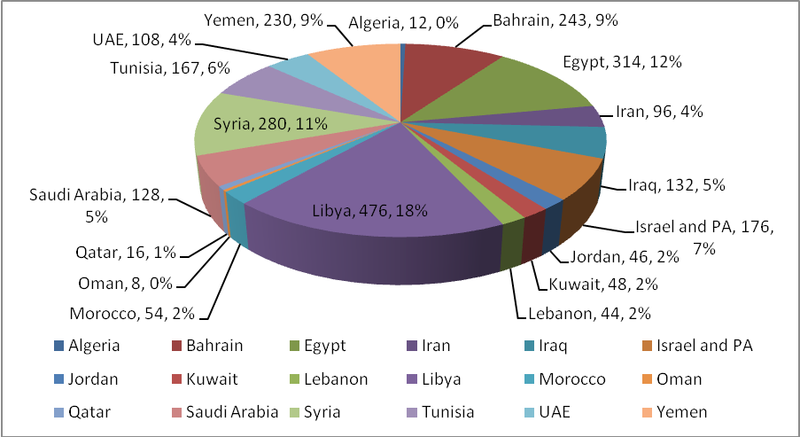 In 2011, HRW’s Middle East and North Africa Division (MENA) published 60% more documents than in 2010, with the majority relating to closed Arab societies involved in the turmoil and revolution. This represents a major increase over previous years, when HRW gave little attention to violations in closed, authoritarian regimes. In its reports on Libya, HRW sought to erase the NGO’s previous cooperation with the Qaddafi regime, including MENA Director Sarah Leah Whitson’s central role in marketing Saif al-Islam Qaddafi as a reformer. The lack of an independent investigation of ties between HRW and the Qaddafi regime continues to stain HRW’s reputation. HRW reduced its disproportionate focus on the Arab-Israeli conflict by issuing more reports, press releases, op-eds, and other publications on Libya, Egypt, Syria, Bahrain, and Yemen than on other countries in MENA. However, “Israel and the Occupied Territories”1 still received more attention than Tunisia, Saudi Arabia, and Iraq. For the first year since 1995, in 2011 HRW did not publish a major report focusing on Israel. HRW also published an almost equal number of documents criticizing Israel and the Palestinians. At the same time, HRW’s bias on Israel continued. All op-eds on the Arab-Israeli conflict published in major international platforms focused on allegations against Israel. MENA Director Sarah Leah Whitson published an op-ed (April 15, 2011) in the Huffington Post exploiting the US Civil Rights Movement to vilify Israel as a racist state and race bait American Jews. In 2011, an alleged member of the PFLP terror organization, Shawan Jabarin, was appointed to the HRW Middle East Advisory Board. James F. Hoge Jr.’s appointment as Chairman of HRW’s Board has had no noticeable impact. In the Middle East and North Africa division (MENA), ideologues Sarah Leah Whitson and Joe Stork continue to control the agenda, at the expense of universal and credible promotion of universal human rights values. **This report includes quantitative analyses of publications from HRW’s Middle East and North Africa section, using a weighted scale methodology consistent with NGO Monitor’s previous analyses. As NGO Monitor has documented in annual reports on the activities and publications of Human Rights Watch (HRW), HRW’s Middle East and North Africa (MENA) division disproportionately focuses on Israel and maintains a deep institutional bias. For years, HRW continually neglected the most egregious and systematic abuses in closed Middle East societies, while using its resources for campaigns alleging Israeli violations. In 2011, however, HRW issued more reports, press releases, op-eds, and other publications on Libya, Egypt, Syria, Bahrain, and Yemen than on the Arab-Israeli conflict, marking a major departure. The evidence suggests that this has merely been a response to greater media attention on protests and upheaval in Arab countries, and that the anti-Israel bias persists. This is the first full year in which James F. Hoge Jr. has been responsible for HRW’s agenda as Chairman of the Board. As this report demonstrates, Mr. Hoge did not address HRW’s major deficiencies, particularly in the Middle East and North Africa division (MENA). The same ideologues – Sarah Leah Whitson and Joe Stork – continue to control the MENA agenda, at the expense of universal and credible promotion of universal human rights values. 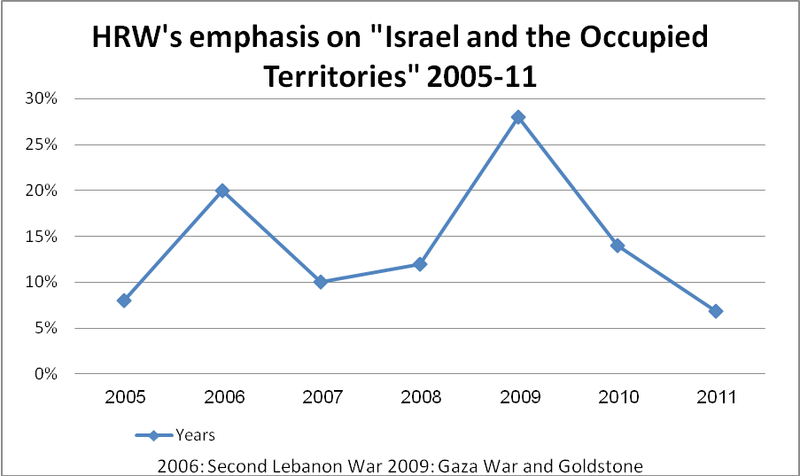 Documents focusing on “Israel and the Occupied Territories” represented 6.83% of the 2011 MENA total. This is the lowest percentage since NGO Monitor’s annual analysis began in 2005. The Middle East in 2011 was characterized by unprecedented turmoil, mass protests, and violence, leading to regime changes in Egypt, Libya, Tunisia, and Yemen. Other countries such as Bahrain and Syria also experienced mass protests and significant state-sponsored violence. In Syria, according to reports of local activists, more than 5,000 civilians have been killed. Table 2 shows the top seven countries in terms of the total number of documents published by MENA in 2011. 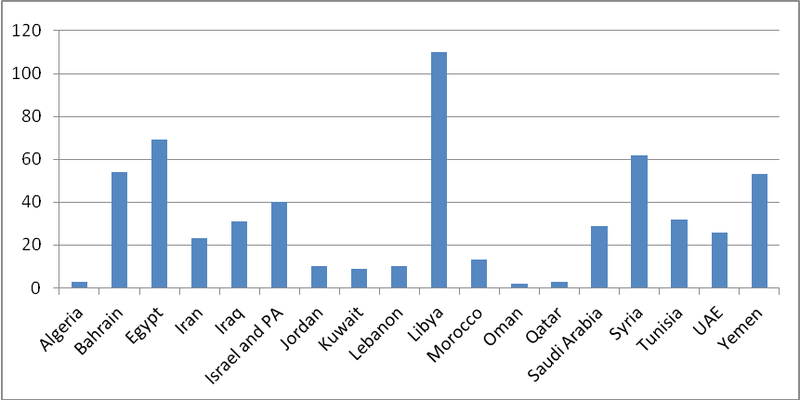 The top five countries in 2011 are those involved in the Arab Turmoil. Additionally, the comparative figures of 2010 make it clear that, previously, MENA had failed to focus significant attention on these countries. The results of the weighted analysis are consistent with the results of the quantitative analysis. One noteworthy result is the high score for Tunisia, reflecting the large number of “Commentaries” (i.e. opinion articles) that mention Tunisia as the catalyst for the Arab Turmoil. Yet Arab-Israeli issues still received more attention than Tunisia, Saudi Arabia, and Iraq, indicating that the shift in priorities is due to the high media profile of countries involved in the Arab Turmoil and not a deliberate decision to decrease focus on Israel. Additionally, the violence and human rights violations in the Arab authoritarian regimes were too massive to ignore, regardless of ideological preference. However, when commentaries and the report are included, only 44% of the documents focused on human right abuses by the Palestinians. Still, this figure is a significant change from 2010 and previous years, in which HRW reports systematically ignored or focused very limited attention on Palestinian mass terror attacks and other violations. This result may reflect the impact of NGO Monitor’s detailed analyses, and criticism from HRW founder Robert Bernstein and others, regarding its disproportionate focus on Israel and its one-sided approach to the Arab-Israeli conflict. Despite the movement towards restoration of the universality which is a foundation for human rights, and which has been violated by HRW and MENA in the past, the anti-Israel bias did not disappear in 2011. For instance, all five opinion pieces published in 2011 about “Israel and the Occupied Territories” focused solely on alleged violations by Israel. These op-eds, published in influential international media platforms such as The Guardian, Huffington Post, and Foreign Policy, reflect HRW’s continuing ideological targeting of Israel, under the façade of human rights claims. The anti-Israel bias is further evident in a statement that immorally equated the intentional firing of an anti-tank missile at a school bus, killing a minor, with an Israeli attack targeting rocket launchers that accidentally injured two ambulance drivers (April 12, 2011). In a similar manner, HRW did not note that Palestinian rocket attacks were illegally fired at Israeli civilians (each one a war crime) when calling on Israel to “investigate recent attacks on Gaza causing civilian casualties and take all necessary steps to avoid civilian harm” (March 1, 2011). MENA’s bias is occasionally more subtle. In a press release about the Palestinian Authority’s violent crackdown on peaceful protesters who were chanting “The people want an end to Oslo,” HRW explained that the protesters were “referring to the agreement that created the PA and gave Israel exclusive control over 60 percent of the West Bank.” This framing, related to the 1993 Declaration of Principles and subsequent agreements between Israel and the Palestinian Authority, simply repeated a biased political interpretation of this process, and ignored ongoing Palestinian rejectionism and opposition to peace with Israel in any form. Likewise, in reporting on the deaths of Syrian demonstrators who had illegally breached the border with Israel on June 5, HRW wrote, “the following day, Syrian security forces shot and killed mourners at a funeral for one of the men killed by Israeli troops. Serious human rights violations by the Syrian government of course provide no justification for Israel’s unlawful use of lethal force.” The last sentence is superfluous and tendentious, serving to demonize Israel as equivalent to Syria. On April 15, Whitson published an op-ed titled “A Matter of Civil Rights,” which framed the Arab-Israeli conflict as motivated by “Israeli racism.” Whitson’s op-ed repeated the words “segregate,” “race/racist,” “discrimination” and “equal/unequal” 23 times in an attempt to portray Israel as a racist state. In this article, American Jews were race baited by Whitson, who negatively compared their support for the U.S. civil rights movement to their support of Israel. In 2011, HRW once again demanded that the Israeli government lift the travel restrictions on Jabarin, while failing to mention the reason – his alleged membership in the PFLP, which has been repeatedly affirmed by the Israeli Supreme Court. Since 2007, HRW has issued three press releases dealing solely with Jabarin’s travel restriction, in addition to two letters to the Israeli government specifically about this issue. By comparison, kidnapped Israeli soldier Gilad Shalit was the main focus of only two press releases and was mentioned in a single letter during the over five years in which he was illegally held incommunicado by Hamas. Prior to the rebellion and overthrow of the Qaddafi regime, HRW’s MENA division had been deeply implicated in marketing a façade of reform. In 2009, MENA Director Sarah Leah Whitson authored an op-ed published in Foreign Policy headlined “Tripoli Spring,” and attributing improvements in human rights in Libya to Qaddafi’s son Saif al-Islam. On December 12, 2009, HRW held a news conference in Libya, under the auspices of Saif-Al Islam and the Qaddafi Foundation, as part of the campaign to market “Saif al-Islam’s reputation as a ‘reformer’,” according to a US state department memo. As the revolt increased, in parallel to more images of brutality became public, HRW slowly revised its previous policies. Only on February 22, 2011, after the Qaddafi regime began to murder citizens protesting against the abusive regime, HRW’s Fred Abrahams referred to Saif al-Islam as “the so-called reformer son.” Just two days later (and exactly one month after the 2011 World Report), Whitson denounced Saif al-Islam, stating “Seif Islam in fact abandoned his nascent reform agenda long before the past week’s demonstrations.” Yet, Whitson had never made this claim before nor did she apologize for her earlier central role in the promotion of Saif al-Islam. While HRW criticized the LSE for accepting funding from Saif al-Islam (quoted above), the LSE addressed the issue in an open, thorough and decisive manner. The Woolf report, entitled “An inquiry into the LSE’s links with Libya and lessons to be learned” (October 2011), investigated the process by which the LSE accepted funding from Libya and presented guidelines for preventing such an incident in the future. Saif al-Islam’s reputation as a reformer was cited in the Woolf report (though not directly attributed to HRW), as one of the factors leading to the LSE’s connections with Qaddafi’s Libya. To the best of our knowledge, HRW has not opened a similar investigation into their own role in the promotion of Saif al-Islam as a reformer, as well as any other contacts with the regime. The media attention surrounding the Arab Turmoil caused HRW in 2011 to focus on dictatorships that in the past have had received scant attention. Notably, however, HRW in 2011 continued to ignore, or cover only minimally, closed societies with poor human rights records that did not receive similar levels of media attention. For instance, HRW has no country page for Mauritania, a North African nation where slavery is still practiced. Similarly, a report on Algeria has not been published since 2008. In 2011, Oman was the subject of a press release for the first time since 2008. Similarly, Qatar had only one press release and two opinion pieces published – and all three focused on the plight of Eman al-Obeidy – a Libyan woman who was raped and fled to Qatar. Prior to this, there had not been a press release focusing exclusively on Qatar since 2003. Moreover, neither Qatar nor Oman has ever been the exclusive focus of a detailed report. As previous NGO Monitor reports have demonstrated, HRW research, at least in the Middle East region, has lacked a credible methodology, and its reports are often based on unverifiable claims quoting unreliable sources. HRW statements often cite unnamed “eyewitnesses” whose veracity cannot be established. Furthermore, witnesses are not always interviewed in person, and are sometimes interviewed by people who lack any specialized training or using online messaging services. This use of unreliable sources led HRW Director Kenneth Roth to tweet about Syrian “blogger kidnapped by armed men. Had written on uprising, politics, being a lesbian,” who was actually an American man from Georgia. In 2010, a HRW official stated that “We seek the limelight,” referring to their tendency to focus on issues such as Israel, that receive significant international media coverage. As shown in this report, in 2011, HRW’s long overdue focus on human rights in closed dictatorial societies in the Middle East can best be explained by the increased media profile of these regimes. In this regard, HRW’s MENA division has yet to restore its credibility. Until there is an independent investigation and accounting of all ties between Sarah Leah Whitson and the Qaddafi regime, the stain on HRW’s record will color all reporting on the Middle East and beyond. Similarly, a change in the ideologically biased leadership of the MENA division is long overdue, as is the need for the implementation of consistent and credible research methodologies. HRW’s focus on Israel is evidenced by the fact that Hebrew is one of the nine languages in which the HRW website is available. The other languages: English, French, Turkish, Arabic, Chinese, Japanese, Spanish, Russian, and Dutch all represent significantly larger group of speakers. This did not count 2 press releases that focused equally on both sides. In 2003, a report called “The “Roadmap”: Repeating Oslo’s Human Rights Mistakes focused on both sides.